I started an Etsy Shop this week. It was a little scary just putting my photography out there like that. But I'm glad I did. It's fun to see it all out there in the world. And the response has been so positive, which has helped immensely. So THANK YOU! While I was setting up my shop, I had very helpful conversations with my dad about all the little details. He would ask me questions about this and that, asking if I'd looked up various things to help calculate costs, etc. Of course, my answer was often, "Oh, I should probably do that." Thank God for that man and his patience with me. Speaking of my dad, he is the biggest ice cream fan I know. In another life, I'm 100% sure he would own an old-timey ice cream parlor where he would serve classic flavors and perfect malts and chat with the locals all day. It would be wonderful. If I were to open an ice cream shop, it would be filled with crazy flavor combinations like brown sugar miso. That's just one of the many ways my dad and I are different. I made this sour cream ice cream to serve on top of a peach cobbler I made for Labor Day. It was nice, but a little too sweet the first time around. The second time around, I altered the recipe by reducing the sugar and it came out perfectly. Rich, creamy, tart, and just what the doctor ordered when you need just a little bite of something sweet after dinner. The tartness is lovely with the swirls of nutty caramel. Next time I am going to try salted caramel- it'll be dreamy. It is still about a million degrees here in Denver (my kitchen is, anyway) so the last thing I want to do is turn on a stove. This ice cream is perfect for days when you can't bear the heat because it has no eggs, which means no need to turn on a burner. When you have eggs, they need to be heated to a specific temperature so they are safe to eat. Here, you need only mix the ingredients together and give them a whiz in your ice cream machine. Good to go! 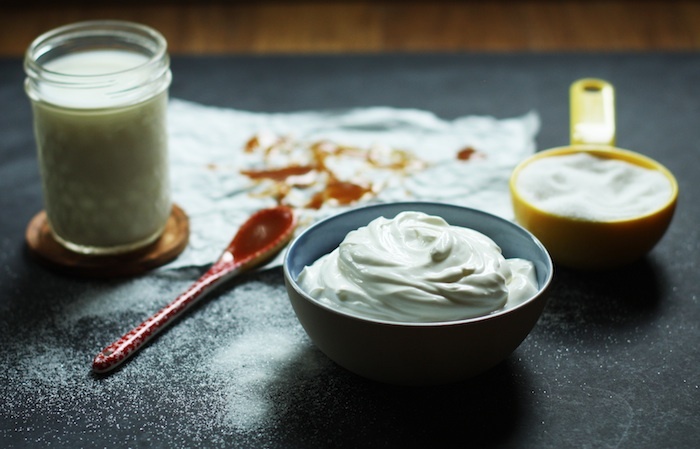 In a large bowl, stir the sour cream, whole milk, sugar, lemon juice and salt together. Chill the mixture in the fridge for at least 1 hour and up to 8. Freeze in your ice cream maker according to the manufacturer's instructions. Layer 1/2 the ice cream in a loaf pan or other freezer safe container. 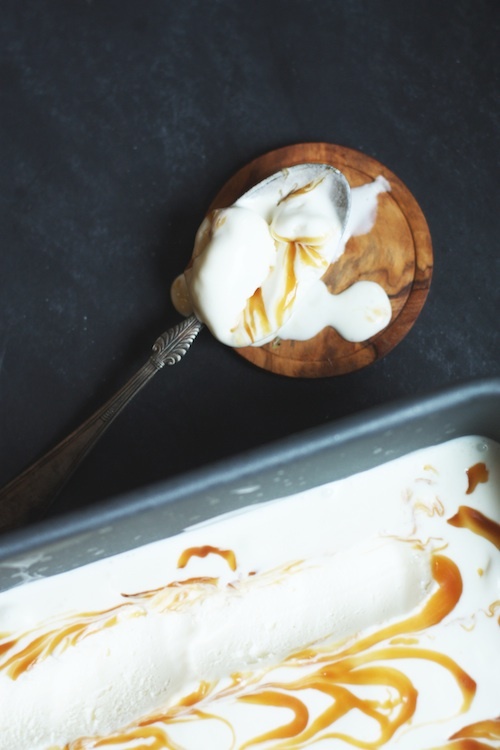 Drizzle half of the caramel over the ice cream. Top the with the remaining ice cream and drizzle with the rest of the caramel. Place in the freezer until hard, about 6 hours.